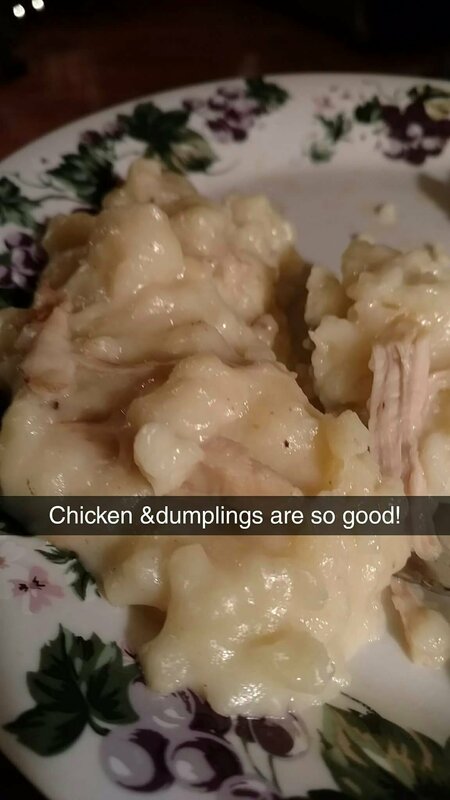 Got my mother inlaws famous homemade chicken and dumplings. Made out of one of my onery roosters. I seriously need to get the tread mill out when we get home. I'm going to gain a few pounds on this trip. The crust is lining the dish, next time ill put one on top. Was this fister a recruiter........if so what was his name? don't knock it till you try it brother.....I was the same way until I tried it. I'm feelin' weak (And lazy)...Taco Bell Tacos! Love me some 7 layer! Wife does the cauliflower taters, I agree not what you think & very edible. Downed six of em' and I'm not ashamed! Here is the book i recommend getting and here is the recipe. I would give you all a link, but you have to pay for a subscription to their site. Baked chicken breast with some au graten taters and some sautéed onions and peppers on the side with a little of the sauce linked drizzled on top. Looks good, I'll have extra chicken and taters . You can have the extra onions and peppers, since you're living all healthy. OK Nate that looks good. Is that there are a bunch of you's (HS) (Hill Billie Speak) on here who can also cook! So I made up a chicken and spinach lasagna. Forgot to reset the temp. That is my style of cooking. I can burn water. My wife does all of the cooking and it is probably a good thing or I would weigh 65 pounds or have a standing table at Taco Bell. I do grill hamburgers and hot dogs when she asks and they come out ok. Or at least kids will eat them. no problem man, I think I may try something like this as well. have you thought about getting an aging system put together? by the way, the next time you are thinking about pulled pork give me a call before hand and ill help you get it dialed in a lot better with times and such. And just buying this for $400.00. Start off small. Well I have time. Not cooking outside while it's 10 below. Nate I watched Alton Brown show where he dry aged. What do you have in mind?? Will do Nate, might be a month or so as I did two and froze some. Its about 10deg here and ill be darned if its gonna stop me from smoking some wings. This this is purring right along and staying at temp easily. Wings look good, 10* not so much. A "T" bone and a porter house from the locker beef stock seared in the cast iron..... (i have actually had that cast iron pan for 12 years and this is the first time i have ever seared or done a steak in it). Tell me about the sprouts, Nate? Good thing I’m not gay. I’d probably marry you. - cut the little ends off the brussel sprouts, halve them and get rid of the loose leaves. Tell me about the sprouts, Nate? Good thing I?m not gay. I?d probably marry you. That is a true statement Charles, Not only that but all those management meetings makes a guy's brain foggy. Man...saw this after we are at cabin.